Wagga was one of many towns and cities throughout Australia to show their patriotism to the mother country and its reigning monarch by enthusiastically celebrating the Diamond Jubilee of Queen Victoria in 1897. The Borough Council struck a special medal with the name of the Mayor Joseph Hayes on it, in commemoration of the event. Joseph P. Hayes was Mayor of Wagga Wagga for two terms; 1897-98 and 1906-08. He was also an Alderman of the City Council, serving between the years 1893-1900 and 1902-1908. In the historical record, his occupation in Wagga is listed as a fellmonger and wool scourer. The medals were given three different finishes - some were copper alloy, some silver alloy and others had a gold top coat. Presumably, they were sold at prices which were graded accordingly. The Museum holds examples of each type struck, and also a special boxed set, comprising a large silver medallion at centre flanked by a gold medal at left (showing the obverse) and a silver medal at right (showing reverse). This set was presented to the Council of the Municipality of Wagga Wagga by Mrs Annie Howarth of Southport, England in 1939. Mrs Howarth was the daughter of Alderman Hayes. Many of the Museum's examples have had holes punched at top centre, and some have been altered with brooch clasps affixed to the back. Today, some locals still dig up examples in their gardens! 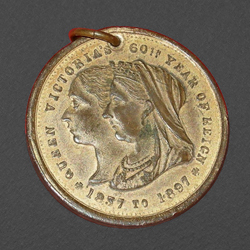 Joseph Hayes' medals remain as a physical reminder of the affection and admiration felt by the people of Wagga for the long-reigning Queen Victoria. This love for a reigning monarch has been seen as recently as 1954, when the people of Wagga turned out in force to greet their new Queen, Elizabeth II. Wagga is still a city which predominately supports the monarchy, and these medals are an early indication of this sentiment.